Piri Reis map unsolved, Controversy over the fact unique map of Piri Reis unresolved. In 1929, a group of historians found an amazing map drawn on a deer skin. Research shows that it is the original document created in 1513 by Piri Reis, a famous admiral Turkish fleet in the sixteenth century. Turkey recognizes admiral in a series of notes on the map that he compiled and copied the data from a large number of source maps, some of which dates back to BC or earlier than the fourth century. 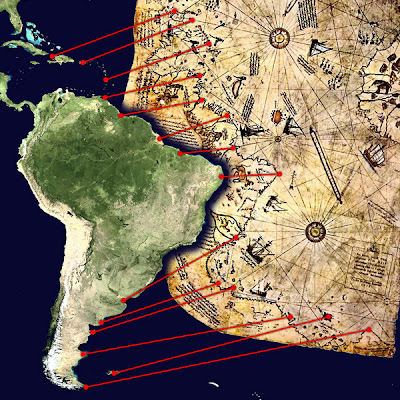 Piri Reis, Piri Reis Map Controversy Still showing the west coast of Africa, the east coast of South America, and the northern coast of Antarctica. Northern coast of Antarctica has perfect details. 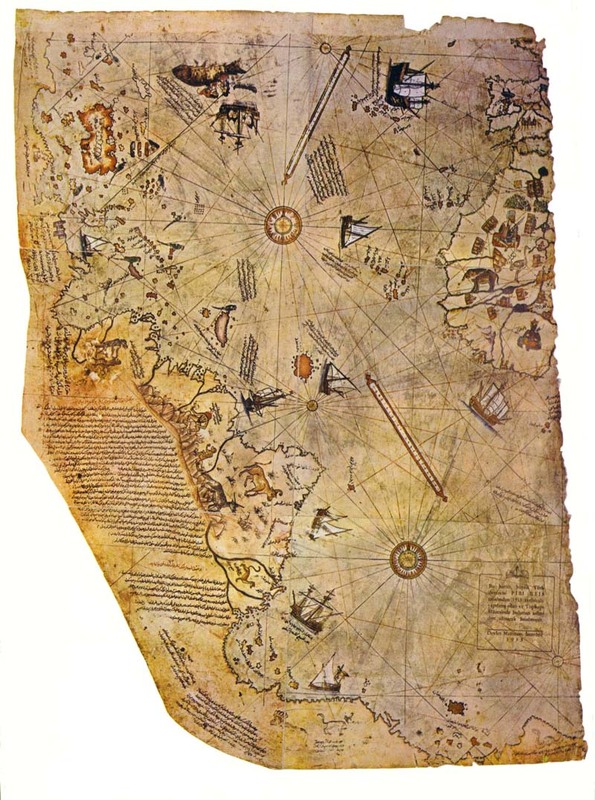 The most puzzling however is not so much how Piri Reis managed to draw such an accurate map of the Antarctic region 300 years before it was found, but the map shows the coastline under es.Bukti Geology confirms that the latest date Queen Maud Land could be charted in 4000 BC ice-free state . Science has officially explained that the lumps of ice covering Antarctica millions of years. Piri Reis map shows that the northern continent that has been mapped before the ice cover. That means the region has been mapped million years ago, but that was impossible because humans do not exist at that time. Further study is more accurate and has proven that the last period of ice free conditions in the Antarctic ended about 6000 years ago. There are still doubts about the beginning of this ice-free period, which has been given by all the researchers who differ between 13,000 and 9000 BC. This is known as the first civilization according to traditional history, developed on the eastern civilization circa 3000 BC, soon to be followed in the millennium by the Indus Valley and China. So, therefore, there is no known civilization that can do work like that. Who was here 4000 years BC, that is able to do things that are now possible only with modern technology? In 1953, a Turkish naval officer sent the Piri Reis map of the U.S. Navy Hydrographic Bureau. To evaluate it, M.I. Walters, Chief Engineer Bureau, asking for help Arlington H. Mallery, an authority on ancient maps, who previously worked with him. After long study, Mallery discovered the projection method used. To check the accuracy of the map, he made a grid and transferred the Piri Reis map onto a globe: the map is really accurate. He stated that the only way to draw the map accuracy is the aerial surveys, but in 6000 years ago if anyone could use the aircraft to map the earth? Hapgood has proved that the Piri Reis map is plotted in plane geometry, which contains the latitude and longitude in the upper right corner of the box "traditional", but obviously copied from a previous map that is projected by using trigonometry ball! Not only early map makers know that the earth is round, but they have the knowledge of the correct circle for a distance of 50 miles. 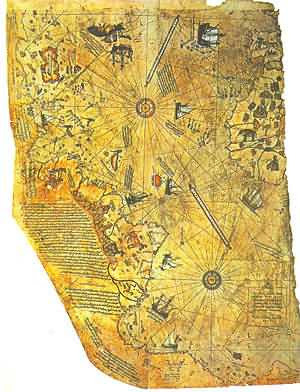 Hapggod has sent a collection of ancient maps, we will see the Piri Reis map is not the only one ... to Richard Strachan, at the Massachusetts Institute of Technology. Hapggod want to know exactly the mathematical level required to draw the original source map. Strachan answered in 1965, saying that it had very high levels. In fact Strachan said that to draw such maps, the author should know about spherical trigonometry, curvature of the earth, the method of projection, which is a very high level of knowledge. 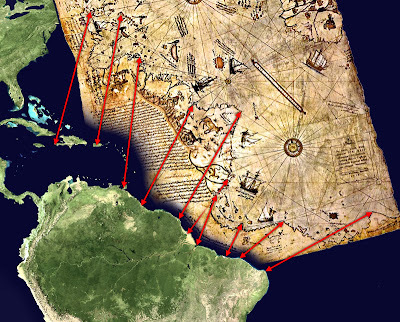 OK, if You think that You are right, please explain more deeply area around La Plata (why two gulfs have slighly different shape than in reality)and to check that You are right please do the same research with Africa. Please explain where river in Western Sahara left? In my opinion Valdes Penisula is too close to equator in Piri Reis map. The proofs are river flows into the ocean. Each river should be reflected both in nature and on the map of Piri Reis. How can you question the position of the Valdes peninsula when this map shows levels of mathematics that are standard with current day technologies? The explanation of the gulfs shape is very easy to explain have you seen the difference in the Louisiana coast since Katrina? This map was made how long ago? How many major earth events have happened since then? Instead of asking questions one should research their theories instead of asking others to do their work for them. Mans level of awareness rises through time. It also drops through time. It is only with knowledge handed down that we keep rebuilding. Some faster, some slower. But none-the-the less...look at all the ancient wonders. And ask yourself...how could Cave Men build a pyramid? Obviously something happened on earth ages ago. Whether is was war or nature, who can say, but ancient ruins stand as a witness. I wonder why those brilliant people try to condemd that old map. the truth is the West civilization are not easily giving recognition to the past Eastern civilization, especially Moslem which been proved more advance during that time than the Middle 'Dark Age' in Europe. He was an admiral, a great one that surpass any brilliant math professor in mapping in Europe at that time. Just that. And please take that's a fact.